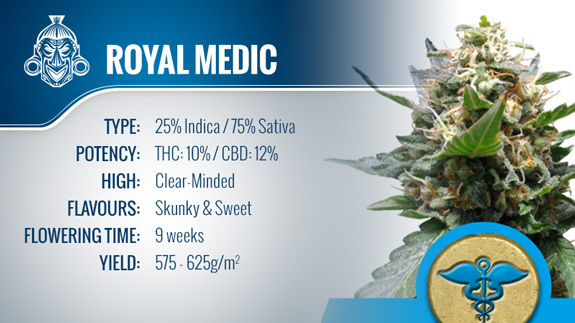 Royal Medic is an incredible strain hailed for its moderate THC and high CBD levels. Royal Medic, as the name would imply, is a strain highly sought after for its incredible relaxation and relief properties. Royal Medic, from Royal Queen Seeds, was produced by crossing two unique, high CBD strains: Critical and Juanita la Lagrimosa, both originally cultivated in Spain. With only moderate levels of THC and high CBD, you can expect to stay clear-headed and focused, while the strain's body effects set in. People have always turned to marijuana for a safe and fun way to get high. It has only been in recent years that science has truly taken an interest in understanding cannabis' true potential. In an effort to rid the body of excess synthetic chemicals, many are turning to cannabis for physical relief. Select breeding has resulted in Royal Medic, a strain specifically created for its healing touch. Blue Medic's high CBD content with THC at around 10%, creates an uplifting and relaxing experience. It is often turned to in order to quell nausea, relieve inflammation, reduce anxiety and to combat the side effects of cancer treatments. Let me say that Royal Medic is a big beautiful plant at full maturity. It is a heavy yielder that can easily grow to over a meter and a half outdoors. You shouldn't have any trouble harvesting 450 to 475g per square meter indoors or upwards of 525g per plant outdoors of dried quality bud. Royal Medic produces a large central cola with smaller bud clusters working their way down the stem. Its parent strain, Critical is responsible for the great yields you can expect from this surprising sativa dominant strain. Royal Medic gets its sativa traits from its Juanita la Lagrimosa side of the family. Another high CBD sativa, Juanita la Lagrimosa is known for its 1:1 ratio of THC to CBD, making it great strain for maintaining clarity while ingesting. Royal Medic also inherited from Juanita a fruity, hazy aroma. In the garden, Royal Medic has an almost lemony scent; present but not overwhelming. You might almost mistake Royal Medic for an indica if you didn't know better. You'll see an array of large fan leaves with narrow blades. They often take on a purplish hue. Royal Medic is a good looking and sturdy plant that will thrive in most standard cannabis environments. Royal Medic is going to take about 8-9 weeks to fully mature, but considering the high yielding nature of the strain, it will be worth the wait. Many growers have reported that germination with Royal Medic happens in as little as 24 hours and maintains strong growth through rooting. These seeds will produce strong plants that won't require a lot of fuss, making them a great choice for growers of all skill levels. Royal Medic inherited its fruity and skunky flavor from it Juanita genetics. It comes across as slightly earthy with strong sweet and fruity overtones. Many say that you can really taste the hashy flavor on exhale. She might hail from Spain, but there is no spice to this strain. You can expect nothing but savory smooth hits. Coming in at around 10% THC with equal or greater CBD levels, you will get a very clear-minded cerebral high that lasts for hours. With such high amounts of CBD, this is a weed you will feel over every inch of your body. This strain was designed specifically for medicinal relief and it does not disappoint. If you are looking to wake up and get a jump on your day, Royal Medic won't slow you down. It will keep your head clear and your body energized. Lower THC strains like Royal Medic are a great way to medicate while keeping your senses about you. Its 25% indica genetics are sure to trigger creative outbursts while your body is relaxed by the THC to CBD ratio. You won't feel burnt out by Royal Medic after medicating, instead you will feel calm and refreshed. One of the biggest medicinal benefits of Royal Medic is its use in alleviating chronic pain and inflammation. The level of CBD makes for an incredible body high. 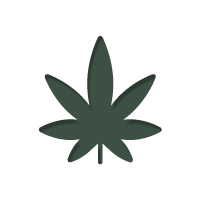 If you are looking for a medicinal cannabis strain that will aid in pain relief, muscle spasms, seizures, nausea or one of the dozen other conditions you can treat with cannabis, this is it. This particular cross breeding resulted in a plant with the incredible medicinal properties of Juanita and the high yields of Critical. Royal Medic is a prime choice for growers looking to cultivate their own high level CBD medicine at home. As more and more people are turning to cannabis for relief, breeders are using their know how to craft high level CBD strains that will target many of the ailments we see all around us. Royal Queen Seeds has outdone themselves with their cross of Critical and Juanita la Lagrimosa. Royal Medic will thrive in standard growing conditions without much tweaking and will produce surprisingly high yields. A short bushy plant that will do well indoors, Royal Medic produces moderate levels of THC which are overshadowed by the even higher levels of the non-psychoactive compound CBD. Anyone who is looking for a great body-high strain that is not a challenge to grow and provides a focused and clear buzz, Royal Medic will suit your needs completely.